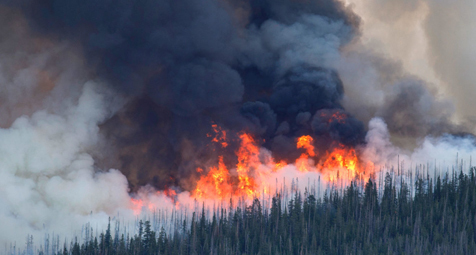 This year has been one of the most active fire seasons in Colorado history, featuring some of the largest, most intense wildfires the state has ever seen. Now, land managers hope prescribed burns can counteract the disturbing trend before it’s too late. For those keeping track, three of the largest wildfires in state history have occurred over the course of just four months. At the time of publication, more than 440,000 acres have already burned in large fires (any blaze larger than 1,000 acres) this year—and this number increases daily—making 2018 Colorado’s second most active fire season, trailing 2002, when nearly 452,000 acres burned, according to federal data analyzed by USGS research ecologist Todd Hawbaker. We consulted a dozen forest managers, researchers, and fire scientists, and none were surprised at the outbreak of large wildfires this year. Among this group of experts, there’s a consensus that western wildfires—including those in Colorado—are burning longer and more intensely than ever before for a reason: The last century of land management focused primarily on fire suppression rather than using prescribed burning as a strategy to prevent large fires from spreading. The problem Colorado faces today is the product of a deeply concerning, decades-in-the-making trend across the West. Now, we wrestle with an urgent question: Is it too late to fight fire with fire? M-Fire motto is “If You Wait Its To Late” we are actively involved in Colorado to prove our clean fire inhibitor will defend the advance wild fire better that the gels they use that has to be install within 3 hours where our product can be install a month in advance without hurting the environment or humans.